INSTA-SEAL | Pro Chem, Inc.
INSTA-SEAL is a superior, fast set, spray-on elastomer membrane coating designed for a variety of industrial applications. 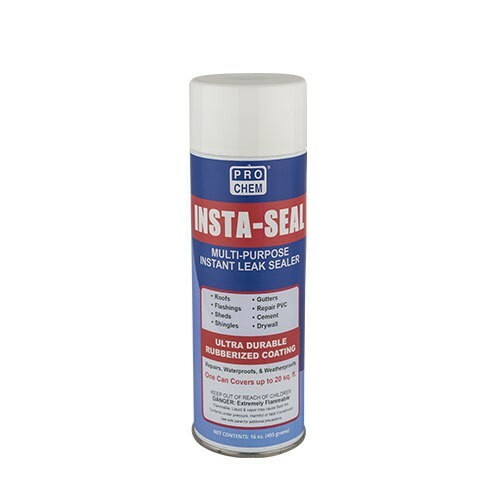 INSTA-SEAL remains flexible and will not crack or peel, even under extreme temperatures. Shake well for 30 seconds. For best results, apply to clean dry surface. If surface can not be completely dried, try to get as dry as possible before applying. Hold can 6 to 8 inches from object. Spray in short even strokes until thoroughly coated. Let dry for 15 minutes before reuse. Clean or remove with paint thinner.